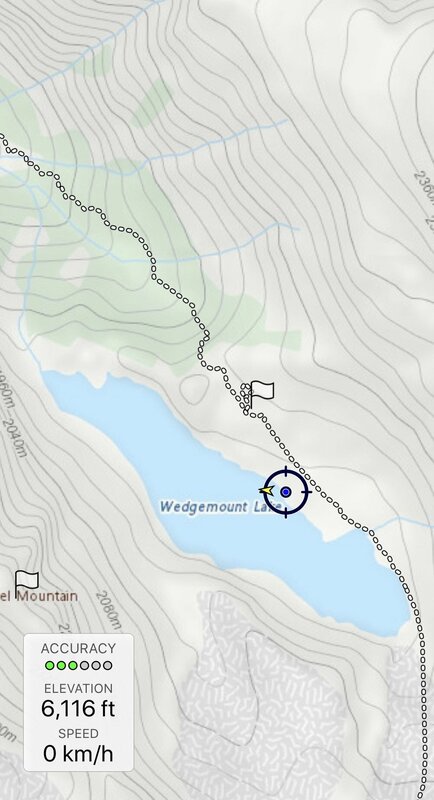 Wedgemount Lake has been on my list of to-do hikes for as long as I could remember. Have one look at the pictures of the lake online, it’s hard not to hear the calling. For one reason or another, I haven’t been able to tackle the hike until recently. I loaded up my car just before noon one day and started cruising towards Whistler. As I reached the trailhead, the temperature gauge was showing 35 degrees Celsius under the mid-afternoon sun. I wished for cooler temperature during the hike, and the waving trees gave me hope until I stepped out of the vehicle. It was a sort of hot breeze when one would experience opening a pre-heating oven, and I was ready for the cooking. The area surrounding the trailhead parking lot was under heavy construction. I wondered if it was meant to increase the number of parking spots as the trail grew in popularity. The lot was completely full When I arrived, and I managed to snag a spot as someone was pulling out. The trailhead started with a bridge over a fast moving creek. Note the apparent elevation difference between the creek and the glacier in the distance. This would serve as a good visual reference for the elevation gain of the trail when comparing to another picture later. The trail does away with switchbacks and goes straight uphill for many sections. The picture gives you an idea of the gradient. As I hike onwards, it became apparent that this trail was different from many other popular trails in the area. 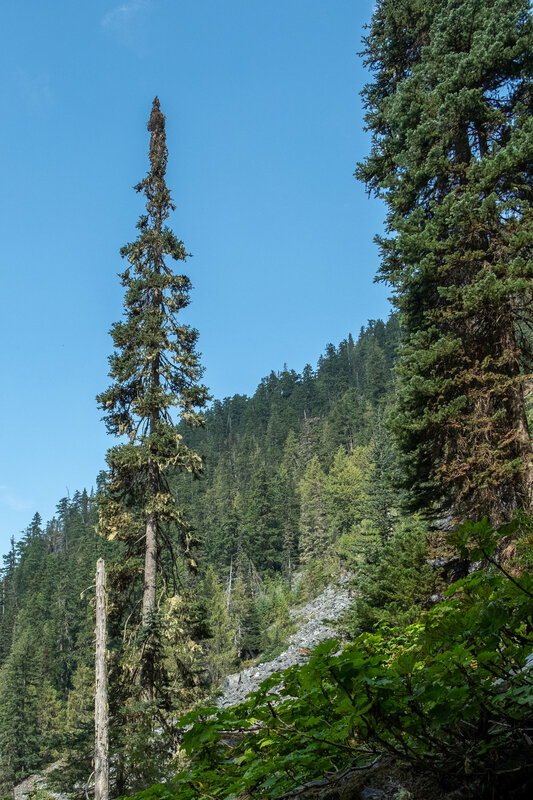 If you ever felt deeply annoyed by the gentle switchbacks on a hike, this trail maybe for you. Other than the beginning of the trail, the trail is largely pointed straight uphill. The hike is not technically difficult by any means, but it becomes realistically tough under the wrong conditions. I cursed my late start on the trail along with the unbearable heat as I waved my arms trying to drive the pesky flies away from my whole body! I couldn’t take any meaningful breaks if I wanted to make it down during a reasonable hours. Make sure you give yourself plenty of time and copious inset repellent. Compare the distant glacier to the picture taken at the trailhead, you are able to see great elevation gain over the length of the trail. A rough route of the last stretch before the lake comes into view. BC Mountaineering Club hut and the outhouse in the distance. It was quite an exhilarating feeling when the lake came into view. It's tortoise shimmer under the surrounding gothic-like peaks gives an unexplainable energy that beckons your approach. I spotted a perfect piece of real estate, an island oasis for the weary soul. Hours of sweat and pain were put on hold as I giddily hopped around the rocks to my final destination. I shed the backpack, which by now felt like an unwanted growth on my body, and I struggled to rip off my boots. I eagerly sat down with my feet dangling over the edge of my oasis into what appeared to be a bottomless turquoise gem. The bitingly cold water was the perfect cure for my overheating body. There was no where else I would rather be at that moment. It was a perfect ending to an overdue hike. My little private "island" where I spent most of my time. You can see a close up in the picture below.